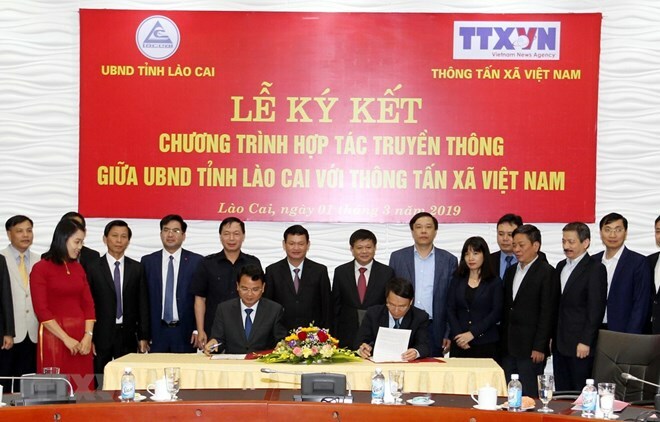 Lao Cai (VNA) – The People’s Committee of the northern border province of Lao Cai and the Vietnam News Agency (VNA) on March 1 signed a media cooperation agreement for the 2019-2020 period. The agreement aims to raise public awareness of the Party policies and guidelines as well as the State laws; popularise Lao Cai and its people, achievements in socio-economic development and Party building; strengthen local political system; ensure national defence-security; and introduce local strengths to domestic and foreign investors. Accordingly, the VNA will feature Lao Cai’s strengths in socio-economic development, especially border economy, tourism, high-tech agriculture, its role in Kunming – Lao Cai – Hanoi – Hai Phong – Quang Ninh economic corridor, as well as effective business models, thus strengthening public trust to ensure stable development. In particular, the VNA will also popularise local good examples – good deeds in compliance with the Politburo’s Decree No.05-CT/TW dated May 15, 2016, on stepping up the campaign on following thoughts, morale and lifestyle of President Ho Chi Minh, along with major political, economic and cultural events in the locality. At the same time, it will provide correct and up-to-date news in case there are unverified and wrongful information about local events. It will allow Lao Cai’s portal and press agencies to use news published on VNA television broadcasts and publications with sources quoted in line with the law. Speaking at the signing ceremony, member of the Party Central Committee, VNA General Director Nguyen Duc Loi said as a strategic news agency of the Party and State, the VNA is improving itself to become a strong multimedia group with diverse kinds of information. He lauded Lao Cai’s rapid economic development and vowed that the VNA will support the locality in popularising news about its socio-economic development, external and internal affairs, and other activities via many of its channels. The VNA General Director asked the provincial authorities to provide mainstream and updated news to VNA, especially those regarding sensitive issues, to orient public opinions and reject wrongful information. He wished that the local authorities would offer all possible support to VNA staff to cover news in the locality. Secretary of the provincial Party Committee Nguyen Van Vinh, who is also a member of the Party Central Committee, said in its development, Lao Cai always receives support from press and media agencies, especially the VNA – a prestigious agency at home and abroad with a contingent of reporters across all the 63 cities and provinces and 30 bureaus overseas.